The Splash Park in Maldon's Promenade Park is scheduled to be open on the days shown on the colour coded calendar below. These dates are subject to weather conditions. Prices for 2019 remain at £2.50 per child per session. A Gold Band is also available at £12.50 per child per day for unlimited sessions (subject to weather conditions). Please obtain your receipt from the ticket machine and exchange for wristbands at the kiosk. Tickets are valid for day of purchase only. 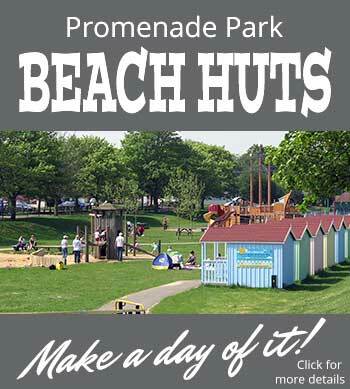 Check out the special deals when you hire a beach hut for the day. Sessions are 30 minutes long, allowing about 20 minutes in the water and 10 minutes for people to leave the area and for it to be prepared it for the next session. In the interests of safety, there is a limit to the number of people in the Splash Park during a session. You can also buy tickets in advance at the Maldon District Tourist Information Centre. You will need to collect these in person. To help ensure that everyone enjoys their visit to this Splash Park, all visitors are requested to adhere to the rules displayed on the notice boards. Opening times are subject to weather conditions and maintenance and cleaning requirements and it is advisable to check before travelling - please call the Tourist Information Centre on 01621 856503 for up to date information. With large numbers of children playing together, infection can spread quickly. Parents are asked not to bring an unwell child to the Splash Park - especially if they have experienced diarrhoea or vomiting in the previous 48 hours. Waterproof dressings should be used to cover any cuts, grazes or veruccas and children should be protected from the sun with a high factor sun cream. All accidents occurring in the Splash Park should be reported to First Aid personnel immediately. All users of the Splash Park should wear appropriate swimwear at all times and very young children must use swim nappies. Disposable swim nappies are available in small, medium and large sizes from the kiosk for a small fee. Should any child have a ‘little mishap’ the facility could be closed for up to 4 hours for cleansing purposes - please help us to reduce this risk. DO NOT run in the play area or climb on the play features. DO NOT bring water guns, plastic bottles or other containers into the water area. DO NOT drink the water. Although it is quite clean, it is not advisable to drink. DO NOT bring food, alcohol or glass bottles into the Splash Park. PLEASE NOTE dogs are not permitted in the Splash Park or within the surrounding fenced play area.